If you are out and about in the community this month, be on the look out for the Children’s Miracle Network Hospitals paper balloon icon pictured to the right. 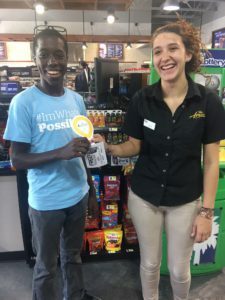 Rite Aid and Sunoco A+ locations are fundraising for the MUSC Shawn Jenkins Children’s Hospital and if you donate to CMN Hospital’s in the Charleston area then all funds stay local to help support this cause. Zion Thomas, CMN Hospital’s Champion for the state of South Carolina, pictured on the left, joined us in Summerville to thank some of the Sunoco associates for fundraising on our behalf. In 2016, the Charleston area Sunoco locations raised over $40,000 for MUSC. Zion is a sickle cell patient at the MUSC Children’s Hospital and is an advocate for the campaign to build the new hospital. He enjoys attending fundraising events and telling his story to those out in the community. Pictured on the right is Rite Aid employee, Jeff, at the West Ashley store located at 1115 Old Town Road. They were the highest fundraising location for Week 3 during the CMN Hospitals campaign. Each week the highest fundraising location receives the traveling trophy along with a prize. Dunkin Donuts was the special treat for this store to celebrate their wonderful accomplishments during the campaign. Rite Aid raised over $13,000 in 2016 to support the campaign to build the new MUSC Shawn Jenkins Children’s Hospital. Don’t forget to visit our MUSC friends out in the community and make a donation during the month of April. Sunoco’s campaign will end on May 3rd and Rite Aid’s will end May 6th.